Finding the best vocal mic for your specific needs is a big challenge – especially when you throw a tighter budget into the mix. However, I’ve done some research and come up with five of the best vocal mics that are available for under $500. I’ve sifted through the plethora of options and narrowed the choices down to save you time and effort. Have a quick read below to see if any of the mics take your fancy. 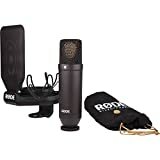 There are some important factors that you need to consider before going ahead and picking the best vocal mic for your needs. This section is especially helpful if you’re new to all this (don’t stress, we’ve all been there!). A frequency response is simply the range of frequency that the mic is able to detect. They can vary from high to low and they are typically demonstrated in hertz. Mics that have a frequency response of 80Hz-15Hz are great for vocal recordings. The top mics for recording vocals will have a great amount of sensitivity. This is an excellent feature for people looking to record quieter vocals. The sound pressure level is commonly recorded in decibels and this tells you the highest volume that the mic can handle. It’s important for mics to feel strong and durable. An easy way to gauge this is by keeping a lookout for the materials that are used to construct it. If they’re sturdy materials, like metal or steel, you can be confident that it will last you during the day-to-day use. It’s common for vocal mics to require power – this is provided by phantom power. This power system involves an XLR socket and wire. All you have to do is plug it in and switch on the phantom power prior to selecting a channel, and you’re good to go. Heil are known to create high-quality mics that enable you to get the most out of your vocals – and the PR-40 mic is no different. 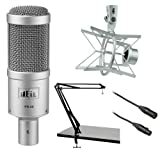 Steel materials are used to construct this mic which makes it strong and durable. The frequency response range of 28Hz-18kHZ is impressive as it gives you a lot to play around with. There’s a total output level of 53,9dB at 1,000Hz. The Rode NT1 mic has been created with fantastic midranges, awesome bass production, and remarkably high frequencies that are smooth. Instant clarity, consistency, and a true HiFi feel. The improved quality, even just recording vocals, affects the whole mix drastically. Mixing a song is easier and more satisfying. 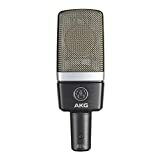 I noticed that the AGK C214 is essentially a more budget-friendly option to the C414 mic. It provides you with a professional grade sound at a lower price than you may be expecting. May be prone to faint popping sounds – but this can easily be remedies with a pop filter! For the price, this is a very minor downside that’s easy to deal with. If you’re looking for a professional high-quality MIC to add to your collection or looking for your first professional MIC, this is it. 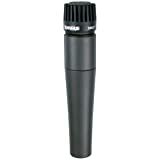 It’s common to find this Shure SM57 mic in studios and in the hands of performers for a reason. I liked how it has a very clean, warm sound which makes it fantastic for a variety of instruments. Great microphone! Does its job as a dynamic mic. It can be used for many different instrument applications for live or recording, it’s a must have for producers, performers and sound engineers or just anyone who needs a reliable microphone. 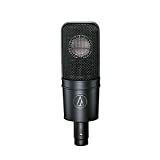 The Audio Technica AT4040 has a great frequency response along with very smooth sounding recordings. Be sure to use the above review to guide you towards picking the best vocal mic for you!